Beyond the river Modione (Sélinos) near the source of water Gaggera, to the west of 'Acropolis of Selinunte, there is a sacred area extended appointed Sanctuary of Malaphóros, the name derives from the main temple found, built in honor of Demeter "bearer of pomegranate". The area bounded by a sacred enclosure, has a square shape and there are inside: altars, places of worship and different stele. 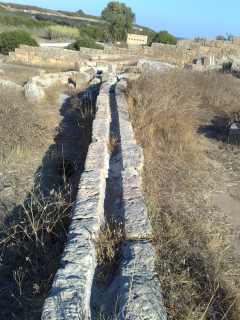 To témenos (land intended for the worship of a god) enters from the north-east, through a propileo monumental columns, before whom there is a circular structure, typical cult eleusini (ricorderebbero well Callicoro of Eleusi, for others could be the base of an altar). To the right of propileo there are the remains of a long tunnel porch, with seats internal and external, presumably to allow the funeral to stop. In addition, in témenos were discovered two altars for the sacrifices and a well. 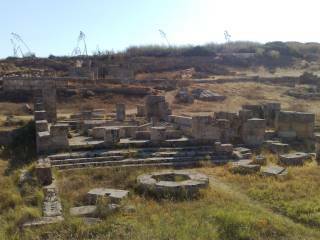 Moved northward from témenos Malaphóros is located the Sanctuary of Zeus Meilìchios, composed of a sacred enclosure and a small temple. 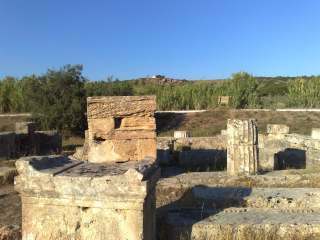 The temple, with columns and fluted monolithic, rises at the bottom of the fence on a stilobate with two steps, is characterized by both Doric elements that ionic, as the Temple of B 'Acropolis of Selinunte. Its structure resembles a building Punic era. It comes also from the area an inscription which speaks of a rite of purification, there appear the names of Myskos and Euthydemos, figures important for the city of Selinunte, a sort of local heroes with their sanctuaries , Where the rites were held on them. It is assumed that near Sanctuary of Malaphóros sostassero the funeral leading to the dead necropolis of Manicalunga. Furthermore, the sanctuary has a great importance from the point of view ethnic-historical, as a place where they met several overlapping ethnic groups since ancient times historians. Widespread was in shrines of Demeter and Core (almost always outside the walls) and architectural features typical was the fact that the cult of the dead are united to that of fertility, with only female practices. 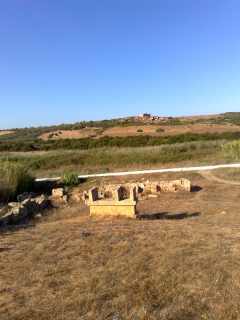 The position of Sanctuary of Malaphóros outside the urban area of Selinunte, near water (sea, river and the source of water Gaggera), it is significant for ' analogy that shows the Tesmofória, namely shrines dedicated to Demeter Tesmefora (goddess of agriculture and marriages). In Sanctuary of Malophóros were found artefacts from various sources, kept in the National Archaeological Museum in Palermo. Several statues and terracotta masks, reproducing the female figure of a deity, probably Demeter. They came to light some vases and Corinthian protocorinzi, arule and a bas-relief with the representation of the abduction of Persephone from Hades-of Pluto. Recuperate also a number of steles gemine, ending that is at the top with two heads, one male and one female, representing perhaps the pair divine Zeus-Pasikráteia, deities linked to the cult of the dead. Finally found many lamps cone monogram Constantinian, testimony of a Christian settlement sovarappostosi between the third and sixth century BC.